It took two and a half years for Meriwether Lewis, William Clark and the Corps of Discovery to cross the great unknown, reach the Pacific Ocean and return home to St. Louis safely. It all started in 1804 after Thomas Jefferson finalized the Louisiana Purchase from the French… Jefferson needed the new land explored, charted and marked with a new American presence. The ultimate goal was to find a navigable waterway that would connect the Missouri River to the Pacific Ocean. 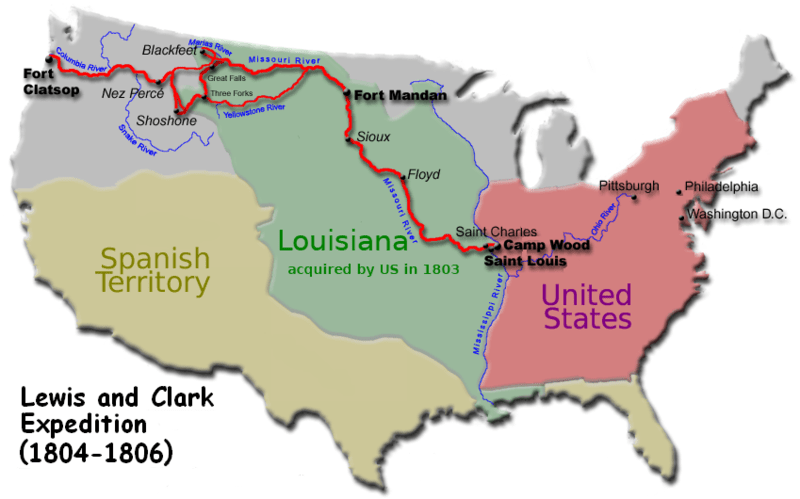 Lewis & Clark failed to find such a waterway in what had become America’s Greatest Adventure. I just finished watching a 3+ hour long Ken Burns documentary on Lewis & Clark. It was extremely fascinating – if you’re into that sort of thing. One historian argues the great exploration west was more challenging than Apollo 11’s first mission to the Moon… after all, the astronauts had open communication lines to their home base in Houston, Lewis & Clark had nothing. The Corps of Discovery (as they were called) came across friendly and hostile native tribes, discovered news species never known before to the settlers back east, saw majestic mountains and valleys like Yellowstone and Mt. Hood, suffered cold and hungry nights … all in the name of exploration. All in the name of adventure. It’s hard to condense a 2+ year journey, and 3+ hour documentary into one blog post … but I just wanted to touch on what Great Adventurers these two men were. After they made it home to St. Louis, you could tell they always had a calling to go back west. They missed the adventure and excitement of the unknown. Do you think you could have left it all behind and commit yourself to years of exploration, not knowing if you’d ever come home? Do you think you would have made it back alive? Post a comment and share your thoughts.